In Germany, UFOP reports that greenhouse gas emissions in rapeseed cultivation need to be assessed realistically for optimal mitigation and that global default values overestimate nitrous oxide emissions. A network of eight partners investigated GHG emissions from the cultivation of rapeseed and found that the nitrous oxide emission factor for GHG accounting in rapeseed is too high for German conditions. Rapeseed is the most important energy crop for biofuel production in Germany. 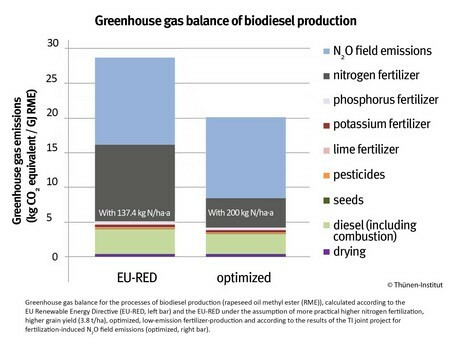 By far the highest GHG emissions in rapeseed cultivation are caused by field emissions of nitrous oxide and greenhouse gas emissions during the production of the required synthetic nitrogen fertilizer. These two emission sources should therefore be in the focus to ensure compliance with the requirements of the EU (RL EU 2015/1513), according to UFOP. Researchers recommend replacing synthetic fertilizers with organic ones, for example, through digestates, which improved the GHG balance in the project when ammonia emissions were minimized. However, one potential problem is the risk of higher nitrogen surpluses. It is just as important to avoid nitrous oxide emissions and save energy in the production of synthetic fertilizers.